All of you feel a sudden pang of hunger twisting in your stomach, like you haven't eaten in a few days. There doesn't look like much edible food in this place. A pitcher of honey and a half-eaten bowl of nuts sit on the nearest low table. Fracture-of-the-Bone nibbles at Chronia's wrist while she speaks, drawing a little blood with its fangs. She winces, bites her lip, and tries to stay focused on the conversation at hand. Chronia has a hopeful look. "Yes, maybe you won't have to kill her." "I so rarely get to leave this chamber, there are a number of things you could do to get on my good side. First, I don't know if you've noticed, but I am naked." She stands and turns around fully, her only ornaments being gold and amber jewelry. "Mortal clothing can only last seconds on my skin before it's rotted away. I hear the Reptile Empire had the particular knowledge of magical weaving. Perhaps this knowledge survives in their Archive? If you were to obtain some clothing of such divine quality that it would withstand my natural entropy, I'll gladly shed a Tear for you." "Or, if you like, you could hunt for some information for me. There's a certain...someone in the Maze who used to leave me love letters daily. It was one of my very few joys in existence." She sighs. "I don't know what I would've done to upset her, but I've sent letters with no reply. I'm just curious, is all. If she's really done with me, then she's as fickle as they all say. Maybe her steward Torgos would know the truth--he's always been honest with me. His office is East in the Almery." Though unexpected, Lai Shan couldn't let the sudden sting of hunger ruin her smug posture, else the posture lose all of its power. "Lost letters, you say? You know, I met another resident on the way here; scaly bespectacled fellow, fond of bandages and questions, seemed to be of the literary sort. I wonder if she knows anything about these misplaced missives?" Lai Shan rose from her seat, looking oddly determined. "But more importantly, your clothing situation is most dire! No proper lady should be denied the gift of fashion!" Having made up her mind, she turns to leave the room. But not before checking the hourglass one last time. "Come Sharis, Seth! We go in search of fashion that transcends the ravages of time!" "Okay then," Aaron rubs his chin thoughtfully, "it's seeming more and more like this can't end peacefully, but let's try one more thing." He turns to the knights again, "would one of you like to take a seat?" he gestures to the thrones cordially (and somewhat desperately). Agrimony and Yarrow gently set Tutsan down and he begins to chirp something like words. Nadzikambia, chameleon adventuress and Agent of N.E.W.B., grows impatient waiting for the poor catatonic Oku to hand over the stone bishop. "Well I didn't really care about it before, but now I won't leave without it, warm-bloods!" She motions for her girls to lower their weapons, and she sheathes her machete. She looks at you pointedly. "Are you the keeper of these birds, mammal? What do you know of anyone looking to destroy this place? Ain't no one can destroy the Maze save the Medusa herself, if she so chooses." "Give him a minute to recover. Something in the previous room has him stunned. Didn't stick around to find out what." before answering, trying to read their body language to see how they reacted to the question. does the name Crucem Capilli mean anything to you? By the way she spoke she seemed fairly certain of her ability to destroy this place." When you sniff the air, you catch a faint trace of the roast Id Pig, and suspect it was dragged off East somewhere. Once again, he felt hypnotized by the smell of the Id Pig's carcass. Either that thing had become a zombie and was still stalking them, or his mind was simply messing with him after the beatup he received. Though the idea of some new creature carrying the corpse was also emerging. That would probably explain the dissapearance of the pig from the room. Smelling further, Sparkly realized it was located nearby the Shadows Trap room. A bit nervous, Luis turned at Yoshiko "Say, Cat... Do you also smell burnt pig in the air? Someone is trying to lure us-"
"Oi, mutt. Y'comin' or wot?" Not the best of ideas, considering the golem lover was next to her. But Luis was known for his impulsive nature. "Listen kitty. Keep the names up and I'll-"
You also notice a new scent wafting from the hole that Yoshiko's Boyfriend created. It's the scent of votive candles, usually lit graveside. You remember back in the Temple of Monomythica, the Altar of Unfinished Quests always had these candles lit in memorial to those who left on quests to prove their worth, but never returned. "Yoshiko wait!" He interrupted the duo, his tone showing anger and the idea of trying to intimidate. Old angry Luis was definitely feeling better "We shouldn't mess with this place. Take a sniff, this is a memorial for the dead..."
Hoping to discourage the half-Tabaxi, maybe they could investigate the new creature that seemed to be wandering around them. Yoshiko made a quick count of her flasks of oil. "I'm sure th' dead 'ere will listen if m'dearest lad 'ere can. If th'git violent w'could book it. Maybe set fire t'em. Sides, th'vines lead 'ere. Can't get m'dear away from 'ere w'thout findin' th'roots." She signalled for her boyfriend to wait a moment before quickly making a stop at that place she could have sworn had have gardening tools to get a pot of soil. She returned with said pot of soil. Sharis watches as Lai Shan takes lead in the conversation, and as she goes to leave. He turns back to face Chronia. "I thank you for the advice. I suppose the least I may do to return the favor is aid my compatriot in acquiring you befitting dress. As for my quest, well, I suppose it is up to fate how it shall go." Sharis turns back to follow Lai Shan. "Perhaps there will be something to truly test our might against ahead." The gold knight stands, as do the green and chrome knights. "Thrones are for kings and queens," the knight responds in Common. 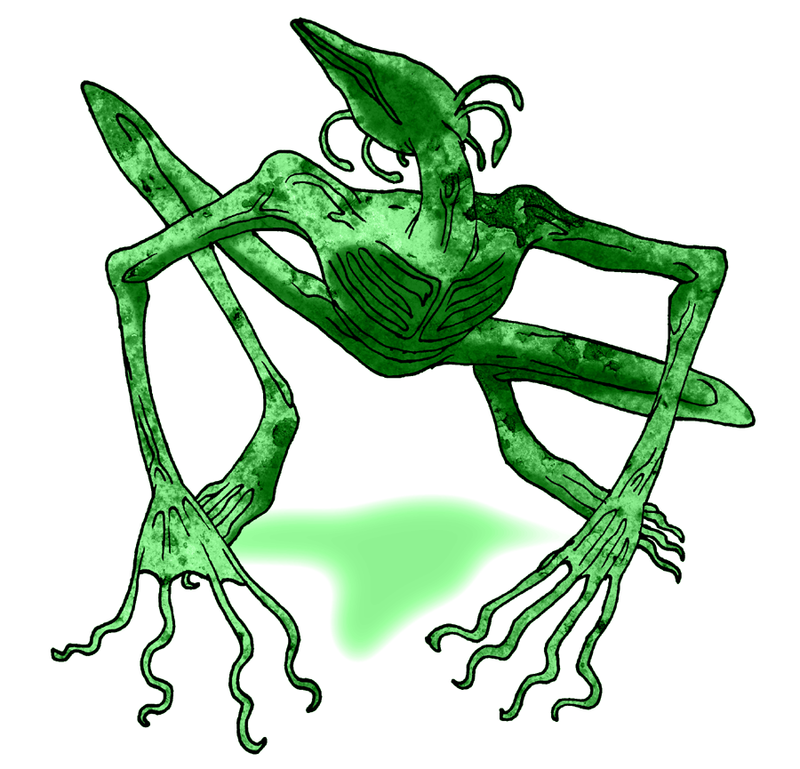 You and Aaron both hear a scratching coming from the next room, the empty room where you mercy-killed Sanguifluus. The scratching sounds like something digging beneath the floor stones. The Oku chirp an affirmative, and proudly confirm their alliance with you. The drop Tutsan into a cross-legged sitting position, where he clutches the stone chess piece and begins whispering in an exotic tongue you don't understand. Nadzikambia sheathes her machete as one of her henchwomen tosses their loot bag over her shoulder. "Crucem Capilli? HERE?" Nadzikambia asks. "The 'Burning Shadow' herself, eh? She's a famous assassin." "And she's been hired to destroy this place?" The other chameleon women pause. Nadzikambia nods to her subordinates, and they slowly begin backing out of the room. "We'd better grab as much good stuff as we can before she does so!" A fourth chameleon woman appears, having been cloaked in the corner of the room, and she begins to leave as well. Before going, the looters dump out the stone chess pieces from their back onto the playroom floor. "It's not a full set anyway," one of the lizardwomen grumbles. "What is your name, mammal?" Nadzikambia asks. "Tell everyone who will listen that the Neonate Empire has claimed this Maze...er, for as long as it stands!" Once you give her a name, she will join her cohorts and continue Southward. OOC: For diverting an entire posse of Chameleon Women sans violence, Truman gains 400xp! The statue seems to ignore Luis, approaches the hole first and stiffly climbs through before lifting you up and in. Your feet set down on a soft carpet of moss and vines. The South half of the room has some half-rotten wooden benches like pews in a chapel. At the North of the room sits a cracked sarcophagus covered in thorny weeds. There is a small stone table in front of the sarcophagus with a trio of recently snuffed out votive candles. The sarcophagus lid remains closed but there are scratches at the seal, as if someone had previously tried to open it to get at the grave goods within. There is a door on the North wall just on the other side of the sarcophagus, through which you can hear muffled voices chattering. Through the West and South walls you hear an echoing cackle from an adjacent room, a mad laughter that's not at all human. The vines here continue to reep through cracks in the North wall and underneath the North door. The hourglass-men's heads are three quarters full of sand on top, the red-quartz grains moving steadily down. The pair begin to pace around the room in a clockwise circle. Chronia shoos Fracture-of-the-Bone away, and the piranha-dog seems to fall quiet after tasting its mistresses' blood. The creature's chalky white hide begins to harden and flake off like layers of slate. "Oh, a librarian was outside of the Archives?" Chronia wonders at your suggestion. "Yes, perhaps one might know about the letters. I'll look into that!" The open exits from the room are Southeast (whence you came), South, and Southwest, with a closed door East. Ashen rises from her seat, distraught. "My Goddess seems hesitant to leave her prison," she whispers with great disappointment. "Perhaps if she had this new finery, she would feel more comfortable in doing so?" She presses close again. "It is truly a task worthy of a champion!" "By the way, your tales were marvelous, my champion. I had not heard of those dire threats, but I am glad you were able to best them, for the good of all. During the Triarchy's day, your people were our most valued destroyers, at least of our natural allies, the ones we didn't breed ourselves. This is how I knew, from the first moment you crashed into the Maze, that I could trust you..."
OOC: All parties leaving Room 27 are still experiencing intense hunger. Also, please add 1 Year to physical age (Lai Shan > 91, Seth > 24, Sharis > 76. "...don't touch that just let. S'prolly bad news if not done proper." She then went over to the North wall and placed an ear onto it, attempting to listen in on the other side. "Y'wanna light th' candles or check whose cacklin, fuzzyface?" You hear a quiet but intense discussion between two or three individuals, but it sounds like the conversation stops shortly after you start listening, as if all or some of the participants have left the room. "Leave them alone, librarian," Sovereign says to Aaron, seeing him try to communicate with the knights. "It's just the two of us here, so I'd rather not set them off-"
"...did you hear that?" Rising up, Sovereign draws her sword and tries to creep up to the next room quietly. Yoshiko handed her Boyfriend the large cloth. "Go turn 'round an spread y'arms with it will'ya, love? Make sure y'spread it real wide. An' you, don't y'dare peek, mutt." Using her Boyfriend's makeshift curtain, she quickly changed into her fine dress and dolled herself up. She emerged from the curtain and took back the cloth. "*ahem* The vines lead forth to the North, where is, perchance, other intruders. Stay or join me, the choice is yours~"
Entering (Room 55), you blink as the light envelops you for a moment before dying down to a less blinding level. The entire floor of this room is an uneven mosaic of illuminated blocks made of a material like glass or cut gemstone. The tiles of the room ebb and flow with strange light, and once in a while reveal strange images on their glowing surface. Very briefly you can clearly see Lai Shan, Sharis, and Seth leaving a large decaying chamber. You catch a glimpse of the Ghost Boy sitting in a room with red floor and red walls, sobbing to himself. You see a trio of bird-masked men entering a vault from a hole in the wall, helping themselves to treasure. You see one of the Queen of Void's White Jacquets walking down a shadowy corridor, their white armor seeming to gleam even in the dark. All of these images are clear but fleeting. The longer you stare at any one tile the more likely it is to reveal some image of the Maze. At the far end of the room, bathed in alien light, kneels a young woman in wildly colorful painted plate mail. She has a large bandage on the right side of her face. Her right arm is in a wrapped in a makeshift sling, and with her left arm she calmly aims a crossbow at your chest. "Hello?" she says in a polite but quavering voice. "W-what do you want?" Leaving through the Southwest door brings you to (Room 12), a small den with a table and short wine cabinet. There are few bottles left here, and one sits on a tray on the table. The tray is tarnished silver.
. (Room 48) is covered in flowered vines and large leafy bushes. Peering into the empty (Room 6), you find two creatures crawling up from newly broken tiles in the floor. A pair of hybrid creatures, like a naked mole rat spliced with a predator cat, both stinking of formaldehyde, begin gnawing at the dead King Sanguifluus' corpse. From their hole they've also dragged in the carcass of the demonic Id Pig, which they've also begun to devour. The trio of thieves--Black Medick, Great Mullein, and Dark Mullein--have all slipped into the crack in the wall they created and are rummaging through chests in the next room. Shuffling along through the scroll pile leads you to another treatise on scale-shape--this one saying that particular patterns of scale size and shape can and should be used as reliable identifiers of social behavior, very much against the last paper you found on the subject. You also find an old letter from someone named "Minister Draco Scabra", about the Reptile Empire's apparently failed diplomacy mission to the Triarchy. 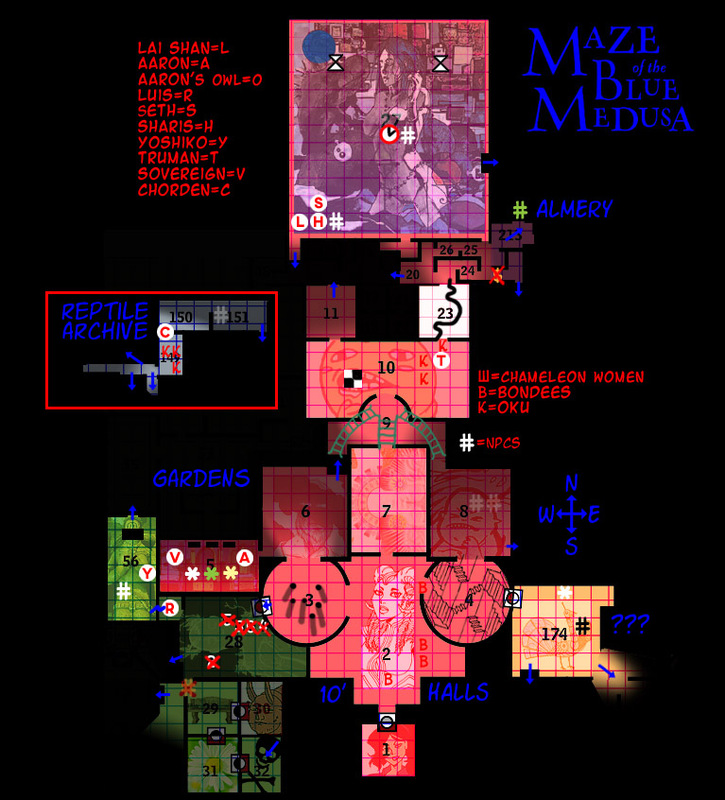 He mentions something of a plan to end the war with the Triarchy, and presenting his case to the Medusa directly. Yoshiko put her hands up shoulder-high. "Now now, let us not engage in violence~ I'm but a passing merchant looking for new wares~ I go by the name Lucky Lucy~"
She turned the attention over to the Statue Boyfriend. "This would be my newly employed golem assistant and-"
She then shifted the attention towards Luis. "This... canine companion... is Luis, a cleric under my employ for the time being~"
After formally introducing the group, she addressed the colorfully armored woman once more. "So. Who might you be and what is your purpose here? Don't worry, any private information will stay within the confines of this... colorful room. Speaking of, I do admire that armor of yours~"
The painted knight trembles. "Lady Morgen Von Klaw," she says, trying to mask her fear, but not well. "Merchant Knight of Imports and Licenses, for all of Shoq City and the Warsaw Trading Company..."
She lowers her crossbow briefly, then raises it again. "Another tradeswoman? Then you're after the Syndicate contract too!" She winces as her wrapped arm spasms. "Get back! My rescuers will return and do you harm if you try anything funny!" She looks at Stone Boyfriend and Luis. "At least you made it this far with your company intact. My men fell to the orchids." She sounds utterly on edge, about to scream. "The ORCHIDS!" she hisses, and curses all the gods. A tear rolls down her cheek. A bird-masked person pokes her head inside the door East. "Lady Morgen? OH!" the bird-girl squeals. "WHO IS THIS?" "Lucky Lucy," Morgen repeats bitterly. "Lucky Lucy" shot a glare at the painted knight before putting on a sly grin. "Now now~ Let us not put false intent into other people's mouths~ It's bad for business if the accused was in fact an innocent customer. Plus..."
"You'd unintentionally give away valuable info towards the wrong people. What if I told you that I do not, in fact, know what this "Syndicate Contract" you are referring to was? You'd have in fact leaked out this info to a new potential rival." "But~ That is just a possibility. As I've said, all private information stays in these walls. Instead, let us behave as tradeswomen and negotiate some deals. Like, for instance, medical aid for you in exchange for more information on this "Contract". My condolences to your men, by the way." "I'm sure they fought bravely. Although I'd like to know more of what you mean by the Orchids. Perhaps we could help you deal with that issue too." "Gentlemen, I regret to say that I've misread the situation." Lai Shan sighed as she leaned against the table. "I thought at first that this place was a prison, lined with traps and guards and closely guarded treasures and the like. But after my last few curious encounters, it would seem as though an entire society exists within these walls." She turned to Ashen with a scrutinizing look. "You wouldn't happen to know any more about the residents of this place, would you?" she asked while laying down her satchel to fetch her waterskin and a folded bag of rations; nuts, dried fruits, jerky, and other non-perishables. "I don't know about you guys but I am famished. Anyone want some?" Lai Shan asks while munching away. A fleeting moment of comfort washed over Chorden, as he found himself alone in the archives. What nerve these "bird brains" had of wrapping him in matters that were no concern of his. Of course he couldn't simply dissuade their order, what with a murder of three to outnumber him. Though it would be all too simple now to leave them to their devices, remaining could prove beneficial for him to. Since they surely knew their way around this domain better than he was, they could prove to be valued guides throughout this journey. At the very least they could incidentally lead him back to his companions, if fate would allow such a reunion. Ashen Chanterelle scratches her still sore wrists. "Well, my imprisonment wasn't so comfortable," she grumbles. "Truly I had not realized that some semblance of society would be retained, but I will help you try to sort out the reasoning." "I do know that at the end of the Reptile-Triarchy War, a conspiracy on both sides worked with the Medusa to abduct the Three Goddesses. Perhaps the Medusa allowed these traitorous ministers to preserve some of their culture intact? I mean, the Reptiles have their own Archive, after all. Who's to say there's not some bit of the Triarchy alive and well within this Maze too?" "I must say, if any of these traitors are alive and well in the Maze, I shouldn't hope to meet them. What kind of person sabotages their own kingdom's war efforts, betrays their own people? What cause could be so alluring to them?" The bushes West rustle in (Room 48), and a spindly green creature emerges crawling on all four limbs. It looks like a gaunt green corpse of a man with a closed flower bulb for a head. Skinless, but where muscle and sinew would be there is only tight twists of green plant stems that pop and hiss as fragrant vapor transfers between joints and releases in clouds of mist. The thing rises to its feet and staggers forwards like a drunkard. It has long tendrils on each hand where fingers would be on a human, and it begins to wave them at yo, beckoning you to approach. There are more such creatures bobbing up and down in the bushes that have not yet revealed themselves fully. "How...curious!" Ashen remarks quietly while hesitating whether to flee or approach the being. Morgen grunts in pain. "What does it matter if you're after the Contract or not? It doesn't matter. None of us are leaving this Maze alive!" she replies. 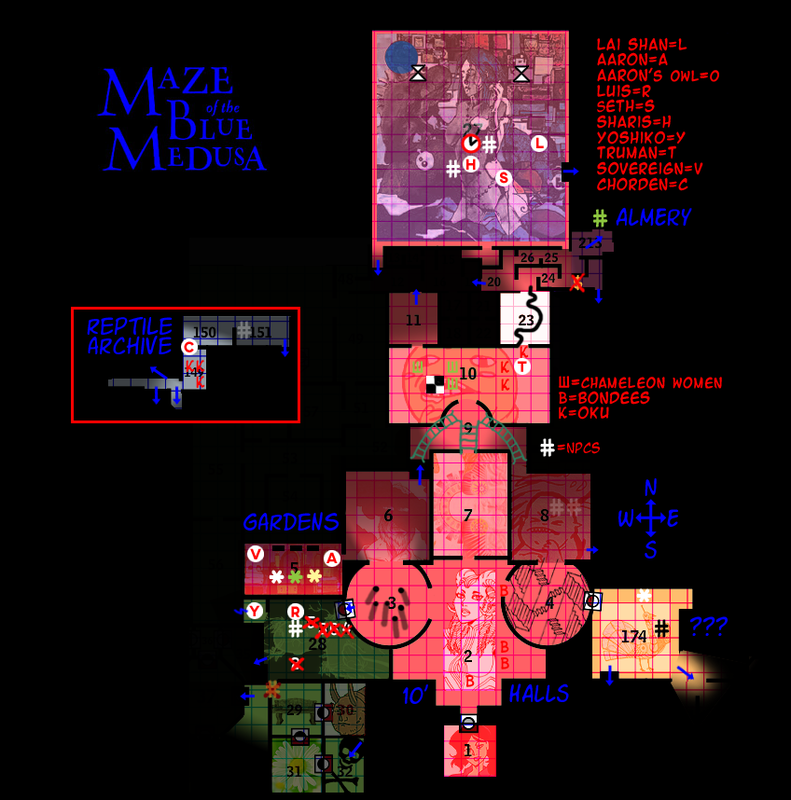 "Syndicate contracted mercenaries, probably a dozen companies, to find a way into the Maze and extract some valuable target. We thought were so smart, so ahead of the rest! We hired a guide, sailed out to some island in the middle of nowhere, and went down these steps...we walked for what seemed like forever and came out not far from here." She turns to the bird-girl. "What about Xanxio, our guide? Did he make it?" to which the bird-girl shakes her head sadly. "Xanxio brought us here because he'd been here before, said he could lead us to our target. But instead he was killed by those damned flowers..."
She drops her crossbow and shifts her position on the glowing floor. She points to the ceiling and walls, where vines crawl through the cracks in stone. "This garden is insane! My rescuers tell me it's been blooming lately, choking all safe spaces with vines, messing with the statuary, spawning these hideous orchid men. Get too close and they can burn you...but even if you keep your distance, they have ways of drawing you in." Morgen shudders. Black Medick tosses you 5 gold pieces. "There's a good lookout! This heist is a bust, though--why, it's mostly old books in here! We're gonna wrap up and head back to the hideout." You find nothing of further use or interest among the scrolls, except for more topics relevant to lizardfolk. You do hear the thump-thump finger-steps behind you, sounding much like the Curator's approach. Black Medick finally emerges from the room, followed by giant Dark Mullein, and then tiny Great Mullein, carrying one big bag of books. Truman scratches the back of his head, making a show of being humble. "I'm nobody, but if you must know, I go by Truman." As Nadzikambia and her troupe move out, Truman's attention turns toward Tutsan. Truman motions the other Oku to help check on him. "Does anyone know what he's saying? Failing that, does anyone have any better ideas on how to snap him out of this? All I can think of is slapping him, and I'd rather not if I can avoid it." Agrimony throws up her hands while Yarrow shakes Tutsan. "It only started when he grabbed that chess piece!" Agrimony sighs. "We need to get a move on..."
"Sounds like some demon stuff," Yarrow guesses. "Uh, I don't know Infernal...or Abyssal, or what-have-you! The Glyph Witch back at the hideout, she does!" Lucy looked at her Boyfriend and then back at Morgen. 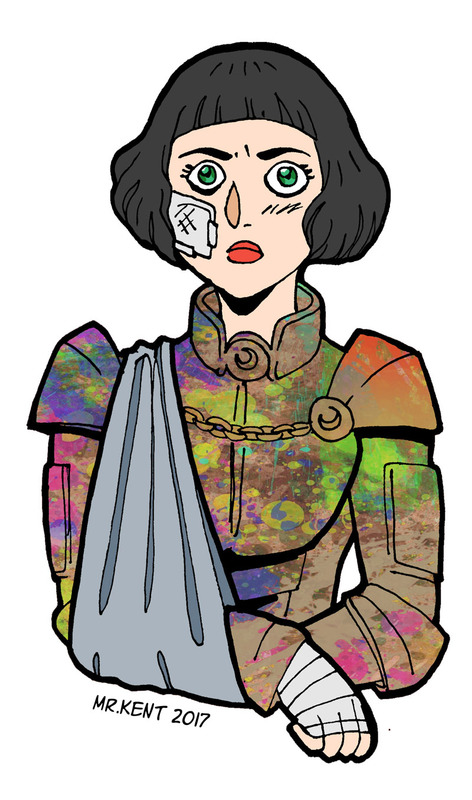 Obscuring the bottom half of her face with a sleeve she tried putting together pieces of what the colorfully armored lady had said. Pointing to the vines. Flowers. Orchid men. Burning? "I once offer you my condolences, Lady Von Klaw. And, as agreed, I offer the services of this Cleric here to ease the pain of your wound~"
Lucy called Luis over and pointed him towards Morgan, whispering "Do your thing, don't screw up." "So what will you do now, Lady Von Klaw? 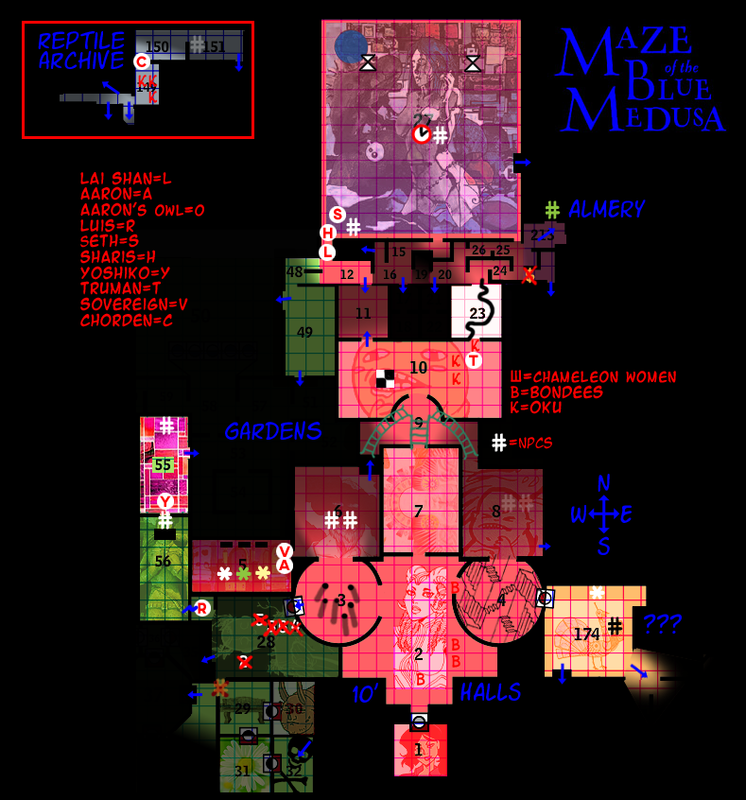 Do you wish to leave this Maze? Or do you require our expertise to mend your Orchid problem? I'm pleased to inform you that we have, in fact, emerged from a room consisting of Orchid Men and survived completely intact. Obliterated much of them too~"
Lucy signalled with a hand behind her back for the Boyfriend to maaaaybe move to the side away from view a little. Sharis walks along the group, listening to Ashen's. "A traitor is just that, Fair Lady. A traitor. They are rarely worth more thought than it takes to bring steel down upon them." he says, with a degree less of his usual boisterous attitude, with a very cold touch to his voice. When the strange plant like creatures come out and beckon forward, Sharis steps forward, half turning his head to the group. "Keep ready. Societies or not, there will always be those out to do you harm." "Hail and well met! We have business to pass forward and search for the archives in this maze." he repeats his statement in both primordial, and in deep speech, unsure of what tongue this strange creature might know. He attempts to look around past the creature as he speaks. A mere five gold pieces eh? Nothing too grand for a reward but Chorden didn't bother to object, it wasn't as if he was there solely for monetary gain. Taking the five gold in hand, Chorden stashed it away in his pouch as the three bird-masked acquaintances stepped out from the hole. Suddenly as the trio made their way out, a familiar sound assaulted Chorden's ear holes. What sounded to be constant thumping and scratching could have only been the Curator itself. As the noise grew ever closer, Chorden shot back to the three and said," The Curator, it's coming! Quickly, lead on to your hideout!..." 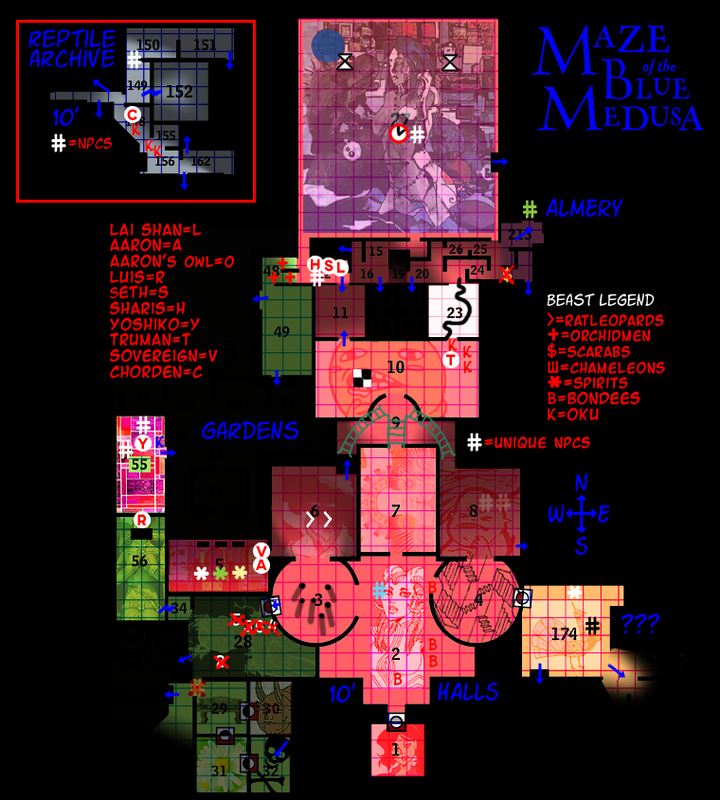 Black Medick leads the group South through a room of mystical darkness (Room 148)--it's even a bit hard for you to see, so Dark Mullein quickly lights a torch. In the corner huddles a cracked clay golem that seems to be causing this darkness. It watches you run past with empty eyes as inky black cracks spiderweb across its body. Black shadows leave the golem's fissures and float into the air, twisting like oil moving through water. The golem does its best to cover the cracks with its hands, but it seems to be leaking shadows at an alarming rate. As you reach (Rooms 155 & 156), you see shadows dance on the walls, darkness spreading from the golem you passed. Three shadows specifically take on humanoid shape, gyrating playfully on the walls. You hear voices emanate from the shades, abrasive to your ears, like a tin cup full of blood being scraped aggressively over masonry. Also, they're mocking you. "I daresay, these chaps have hit a spot of bad luck, eh?" one shade screeches subtly to the other two. "They'll surely be killed, more's the pity," another says, while the third silhouette mocks the way you run. The trio share a pithy laugh. The Curator is now clearly following your group, and gaining speed. "Just a few more rooms South, then we run WEST as far as we can go! Then follow the vines South, straight-shot to the Gardens!" Black Medick reminds his cronies. "We'll see what the other crews have brought in today!" The plant creature responds to nothing, just drunkenly staggers forth. As it lurches forwards, its bud splits open, edges curling back to reveal a beautiful flower, dripping with fragrant nectar. Behind it, two more orchidmen rise to their feet and open up their flowers, each unique and possessing terrifying beauty. You see the hall beyond the creatures takes a turn left/South. Morgen introduces her bird-girl attendant as Kidney Vetch, who has been tending her burns thus far. "If your cleric can do anything more, I'm all for it," she says, looking at Luis. When you introduce Boyfriend with a gesture, Morgen shakes her head. 'Oh no no. That is not an orchidman. It's a...I don't know what...?" "Walking statue!" Kidney Vetch explains. "The garden makes them too, but we don't know how, or why..."
Morgen continues. 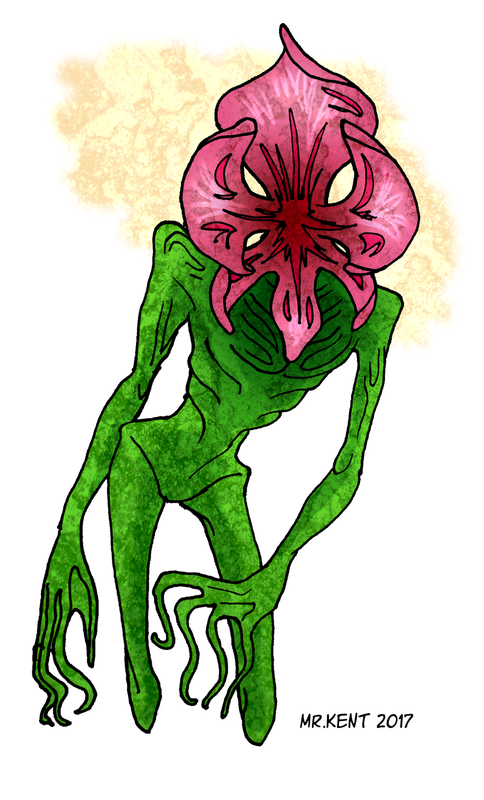 "The orchidmen are plant monsters that bleed and secrete acid. They have a powerful pheromone effect that lulls you into a calm...and then they get you! One of my men was exposed to the chemicals, and walked right up to one and just surrendered! The orchid just had its way with him then..."
Kidney Vetch speaks up again. "The closer you get to the middle of the Gardens, the nearer to Zamia Torn, the stronger the plants get, we've found. And they just keep coming! Soon our hideout here will be overrun, and where will we go then?"